The stage is their pulpit. And on it, in long, curly wigs, bell-bottomed jeans and chest-baring shirts, they become what they preach, mimicking note-for-note “Stairway to Heaven” and “When the Levee Breaks” the way Led Zeppelin would have played it. No Quarter isn’t as much a band as it is a group of ministers sermonizing in the church they’ve built to Led Zeppelin. Christiansen, a Tacoma-based musician who has played in cover bands for most of his musical career, says that you up the ante when you say you’re a Zeppelin cover band. You’re making a statement. He says that No Quarter’s lineup came together because of “acts of fate”: Christiansen poached a Getty Lee impersonator from a Rush cover band to be his John Paul Jones. He recruited a Plant impersonator he heard on the radio. A Bonham superfan to play drums. On the phone, Christiansen sounds like a giddy Zeppelin fan. He says that as a kid he snuck out to see The Song Remains the Same when it screened at his local theater —paying the price for it later. And then he saw the band live. It changed his life. And years later, when he formed No Quarter, he says he intended to do exactly as Zeppelin did. Play small clubs. Generate a buzz. “Before I know it, I’m at my place of work, someone from Montana calls me to play a show there. Then we’re playing the Big Easy, we’re playing the Knitting Factories, we’re on a national tour,” he says. In the 11 years since No Quarter formed, the band has shared stages with Jefferson Starship, Loverboy, Steppenwolf and Nazareth, among others. At one point, the band played at a hot-air balloon race in Texas in front of 30,000 people. “We had the bragging rights of saying we played in front of more people than Led Zeppelin played in front of at their reunion concert,” he says, laughing. They’re not Zeppelin — Christiansen says they get that. 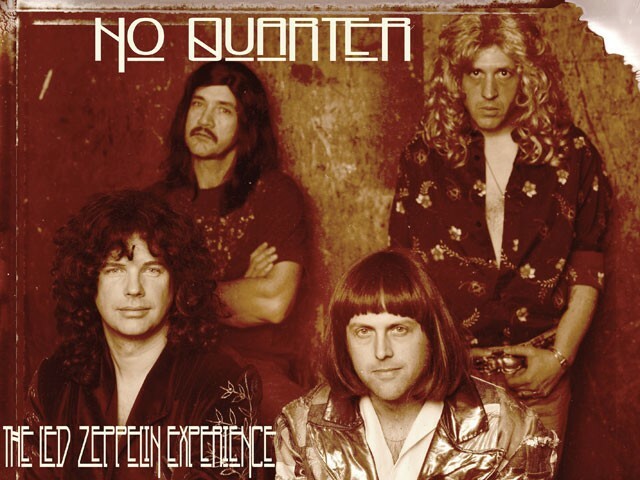 The guys in No Quarter know that it’s not the ’70s. Free love is dead. Their hair isn’t real. They’ve got to watch out for groupies. Christiansen says the band isn’t “like the Partridge Family”: They are musicians, but they’re also actors acting — they’ve got to sell it perfectly onstage. “We’re really trying to get it note for note to replicate a moment in time — we really have to have our wits about us,” he says. And just when huge crowds and superfans start to make them feel like the real deal, someone’s always there to point out that they’re not. Zeppelin or not — it’s working. No Quarter plays the Knitting Factory on Saturday, Jan. 30, at 7 pm. Tickets: $10. Visit www.ticketswest.com or call 325-SEAT.